During the second trimester, Saint John middle school Faith in Action classes have been busy with many projects designed to integrate the Beatitudes into their daily lives. 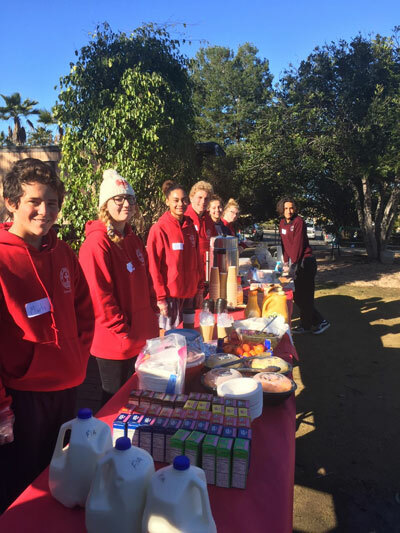 The eighth graders organized and served a fresh breakfast to people who obtain food at the parish pantry. Several students also worked alongside the adult volunteers in the pantry bagging rice, beans, and apples, and restocking shelves. Others greeted people and helped carry their shopping bags to their cars. The food and drinks for the breakfast was supplied by each of the 14 students in the class, and several parent volunteers and youth minister Isaac Deken supported the kids’ efforts on site. The breakfast was received very enthusiastically and was a very special treat for the food pantry patrons, some of whom have no access to a kitchen. The eighth graders will also soon visit Father Joe’s Village to serve lunch. The seventh graders collected small hygiene items at school (many thanks to all who donated) and took them to Brother Benno’s in Oceanside where they made Valentine bags that were distributed to people in need. Not only did the students assemble the bags, but they also made cards for each one to offer the recipients hope in their difficult circumstances. Can you imagine homeless persons opening their bags, expecting to find only shampoo and lotion, and then discovering hand-decorated notes which say God loves them?! Another highlight was a guided tour of Brother Benno’s facilities, including both the main center and the thrift store, and a pizza lunch with homemade cookies provided by the guide! Sixth grade students have been spending part of each FIA period helping the kindergartners with their class work. This partnership is very motivating and rewarding for everyone involved, and it begins to open students’ eyes to the challenges of teaching. As always, many thanks to the parent volunteers who drive on field trips and support the FIA projects in so many ways. The students greatly appreciate being able to call on adults for help in carrying out their projects.